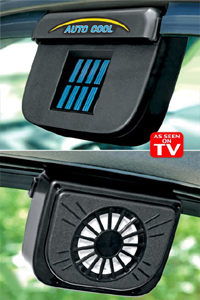 The other day, I saw an ad for a solar powered vent for my car. The device was advertised to help keep the inside of a car cooler by pushing out the hot stale air and drawing in cooler air through the car’s own air vents. I bought one of these devices to see if it might work. What a joke. This thing just does not move enough air. When placed out in the sun, I could almost feel a bit of wind coming from it. But, in theory, the concept may have some validity. When exposed to direct sunlight, the inside of a car can reach dangerously high temperatures. How hot? On a warm summer day, I placed a wireless temperature sensor in my van. The hottest temperature I have seen so far was 147F. That would kill someone if they spent much of any time in the vehicle. Pets would succumb to such heat in a very short time. 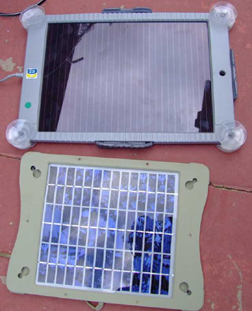 The Auto Cool car vent assembly contains a small solar panel and a brush type motor, driving a squirrel cage type fan. The concept is to place the device over an open car window, then roll the window up, so only the lip of the device remains outside. Some rubber gasket material is provided to seal the window, in its slightly open position. The solar panel in the vent measured only 2.1” x 2.1” for a total footprint of 4.4 square inches. But, the actual solar cells encapsulated in that area measured only 1.1” x 1.65” for an area of 1.82 square inches. This put the fill factor at 41%. An 80% fill factor would have certainly have been better. With only 4 solar cells, the panel’s voltage measured an expected 2v. The short circuit current, when exposed to direct sunlight, measured about 100ma. So, the available power to drive the motor measured only 0.2 watts. When connected directly to a 2 volt DC power supply, the fan motor drew about 50ma. This meant that the solar panel puts out more power than the motor needs at 2v. I suspect that the fan motor is really a 6v device when it should have been a 3v part. When connected to a 6v supply, the motor drew 250ma of current and moved a lot more air at a 1.5 watt power level. But, to drive the motor at that kind of power level, a much larger solar panel, like the one shown below would be needed. The device’s manual claims that their assembly replaces the air inside a typical car in about 20 minutes. I think to be of any use, the device needs to move about ten times more air than that. That would put the power level needed at about 1 watt. More would be even better. I imagine a much larger solar panel, equipped with suction cups, like the panels shown below. It would be mounted on the inside of the front windshield of the car. Wires would connect the solar panel to this vent assembly. Perhaps another option would be to use a 12v rated fan and plug the fan into the car’s cigarette lighter power outlet. Even during a long 10 hour day, a 1 watt fan would not tax the car’s battery. Perhaps during a hot summer day, the combination of a more powerful ventilation fan and a windshield sun shield would keep the inside of the car a lot cooler.